This article is about the term. For the church in full communion with the Pope, see Catholic Church. For the beliefs and practices of other denominations that use this term, see Catholicity. The word catholic (with lowercase c; derived via Late Latin catholicus, from the Greek adjective καθολικός (katholikos), meaning "universal") comes from the Greek phrase καθόλου (katholou), meaning "on the whole", "according to the whole" or "in general", and is a combination of the Greek words κατά meaning "about" and ὅλος meaning "whole". The term Catholic (usually written with uppercase C in English) was first used in the early 2nd century to indicate Christendom as a whole. In the context of Christian ecclesiology, it has a rich history and several usages. The word in English can mean either "of the Catholic faith" or "relating to the historic doctrine and practice of the Western Church". [note 1] Many Christians[who?] use it to refer more broadly to the whole Christian Church or to all believers in Jesus Christ regardless of denominational affiliation; it can also more narrowly refer[according to whom?] to Catholicity, which encompasses several historic churches sharing major beliefs. "Catholicos", the title used for the head of some churches in Eastern Christian traditions, is derived from the same linguistic origin. inclusive, inviting and containing strong evangelism. The term has been incorporated into the name of the largest Christian communion, the Catholic Church (also called the Roman Catholic Church). All of the three main branches of Christianity in the East (Eastern Orthodox Church, Oriental Orthodox Church and Church of the East) had always identified themselves as Catholic in accordance with Apostolic traditions and the Nicene Creed. Anglicans, Lutherans, and some Methodists also believe that their churches are "Catholic" in the sense that they too are in continuity with the original universal church founded by the Apostles. However, each church defines the scope of the "Catholic Church" differently. For instance, the Roman Catholic, Eastern Orthodox, Oriental Orthodox churches, and Church of the East, each maintain that their own denomination is identical with the original universal church, from which all other denominations broke away. Distinguishing beliefs of Catholicity, the beliefs of most Christians who call themselves "Catholic", include the episcopal polity, that bishops are considered the highest order of ministers within the Christian religion, as well as the Nicene Creed of AD 381. In particular, along with unity, sanctity, and apostolicity, catholicity is considered one of Four Marks of the Church, found the line of the Nicene Creed: "I believe in one holy catholic and apostolic Church." During the medieval and modern times, additional distinctions arose regarding the use of the terms Western Catholic and Eastern Catholic. Before the East–West Schism, those terms had just the basic geographical meanings, since only one undivided Catholicity existed, uniting the Latin speaking Christians of West and the Greek speaking Christians of the East. After the split of 1054 terminology became much more complicated, resulting in the creation of parallel and conflicting terminological systems. The Greek adjective katholikos, the origin of the term "catholic" means "universal". Directly from the Greek, or via Late Latin catholicus, the term catholic entered many other languages, becoming the base for the creation of various theological terms such as catholicism and catholicity (Late Latin catholicismus, catholicitas). The earliest evidence of the use of that term is the Letter to the Smyrnaeans that Ignatius of Antioch wrote in about 108 to Christians in Smyrna. Exhorting Christians to remain closely united with their bishop, he wrote: "Wherever the bishop shall appear, there let the multitude [of the people] also be; even as, wherever Jesus Christ is, there is the Catholic Church." From the second half of the second century, the word "catholic" began to be used to mean "orthodox" (non-heretical), "because Catholics claimed to teach the whole truth, and to represent the whole Church, while heresy arose out of the exaggeration of some one truth and was essentially partial and local". In 380, Emperor Theodosius I limited use of the term "Catholic Christian" exclusively to those who followed the same faith as Pope Damasus I of Rome and Pope Peter of Alexandria. Numerous other early writers including Cyril of Jerusalem (c. 315–386), Augustine of Hippo (354–430) further developed the use of the term "catholic" in relation to Christianity. 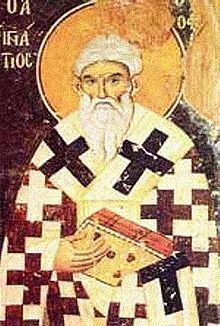 The earliest recorded evidence of the use of the term "Catholic Church" is the Letter to the Smyrnaeans that Ignatius of Antioch wrote in about 107 to Christians in Smyrna. Exhorting Christians to remain closely united with their bishop, he wrote: "Wherever the bishop shall appear, there let the multitude [of the people] also be; even as, wherever Jesus Christ is, there is the Catholic Church." This is the earliest occurrence in Christian literature of the phrase 'the Catholic Church' (ἡ καθολικὴ ἐκκλησία). The original sense of the word is 'universal'. Thus Justin Martyr (Dial. 82) speaks of the 'universal or general resurrection', using the words ἡ καθολικὴ ἀνάστασις. Similarly here the Church universal is contrasted with the particular Church of Smyrna. Ignatius means by the Catholic Church 'the aggregate of all the Christian congregations' (Swete, Apostles Creed, p. 76). So too the letter of the Church of Smyrna is addressed to all the congregations of the Holy Catholic Church in every place. And this primitive sense of 'universal' the word has never lost, although in the latter part of the second century it began to receive the secondary sense of 'orthodox' as opposed to 'heretical'. Thus it is used in an early Canon of Scripture, the Muratorian fragment (circa 170 A.D.), which refers to certain heretical writings as 'not received in the Catholic Church'. So too Cyril of Jerusalem, in the fourth century, says that the Church is called Catholic not only 'because it is spread throughout the world', but also 'because it teaches completely and without defect all the doctrines which ought to come to the knowledge of men'. This secondary sense arose out of the original meaning because Catholics claimed to teach the whole truth, and to represent the whole Church, while heresy arose out of the exaggeration of some one truth and was essentially partial and local. By Catholic Church Ignatius designated the universal church. Ignatius considered that certain heretics of his time, who disavowed that Jesus was a material being who actually suffered and died, saying instead that "he only seemed to suffer" (Smyrnaeans, 2), were not really Christians. The term is also used in the Martyrdom of Polycarp (155) and in the Muratorian fragment (about 177). Since the word Ecclesia is applied to different things (as also it is written of the multitude in the theatre of the Ephesians, And when he had thus spoken, he dismissed the Assembly (Acts 19:14), and since one might properly and truly say that there is a Church of evil doers, I mean the meetings of the heretics, the Marcionists and Manichees, and the rest, for this cause the Faith has securely delivered to you now the Article, "And in one Holy Catholic Church"; that you may avoid their wretched meetings, and ever abide with the Holy Church Catholic in which you were regenerated. And if ever you are sojourning in cities, inquire not simply where the Lord's House is (for the other sects of the profane also attempt to call their own dens houses of the Lord), nor merely where the Church is, but where is the Catholic Church. For this is the peculiar name of this Holy Church, the mother of us all, which is the spouse of our Lord Jesus Christ, the Only-begotten Son of God(Catechetical Lectures, XVIII, 26). In the Catholic Church, there are many other things which most justly keep me in her bosom. The consent of peoples and nations keeps me in the Church; so does her authority, inaugurated by miracles, nourished by hope, enlarged by love, established by age. The succession of priests keeps me, beginning from the very seat of the Apostle Peter, to whom the Lord, after His resurrection, gave it in charge to feed His sheep (Jn 21:15–19), down to the present episcopate. And so, lastly, does the very name of Catholic, which, not without reason, amid so many heresies, the Church has thus retained; so that, though all heretics wish to be called Catholics, yet when a stranger asks where the Catholic Church meets, no heretic will venture to point to his own chapel or house. Such then in number and importance are the precious ties belonging to the Christian name which keep a believer in the Catholic Church, as it is right they should ... With you, where there is none of these things to attract or keep me... No one shall move me from the faith which binds my mind with ties so many and so strong to the Christian religion... For my part, I should not believe the gospel except as moved by the authority of the Catholic Church. —St. Augustine (354–430): Against the Epistle of Manichaeus called Fundamental, chapter 4: Proofs of the Catholic Faith. — St. Augustine (354–430): Against the Epistle of Manichaeus called Fundamental, chapter 4: Proofs of the Catholic Faith. In the Catholic Church itself, all possible care must be taken, that we hold that faith which has been believed everywhere, always, by all. For that is truly and in the strictest sense 'catholic,' which, as the name itself and the reason of the thing declare, comprehends all universally. This rule we shall observe if we follow universality, antiquity, consent. We shall follow universality if we confess that one faith to be true, which the whole church throughout the world confesses; antiquity, if we in no wise depart from those interpretations which it is manifest were notoriously held by our holy ancestors and fathers; consent, in like manner, if in antiquity itself we adhere to the consentient definitions and determinations of all, or at the least of almost all priests and doctors. During early centuries of Christian history, majority of Christians who followed doctrines represented in Nicene Creed were bound by one common and undivided Catholicity that was uniting the Latin speaking Christians of West and the Greek speaking Christians of the East. In those days, terms "eastern Catholic" and "western Catholic" had their basic geographical meanings, generally corresponding to existing linguistic distinctions between Greek East and Latin West. In spite of various and quite frequent theological and ecclesiastical disagreements between major Christian sees, common Catholicity was preserved until the great disputes that arose between 9th and 11th century. After the East–West Schism, the notion of common Catholicity was broken and each side started to develop its own terminological practice. All major theological and ecclesiastical disputes in the Christian East or West have been commonly accompanied by attempts of arguing sides to deny each other the right to use the word "Catholic" as term of self-designation. After the acceptance of Filioque clause into the Nicene Creed by the Rome, Orthodox Christians in the East started to refer to adherents of Filioquism in the West just as "Latins" considering them no longer to be "Catholics". For many years the once illustrious congregation of the Western Church, that is to say, the Church of Rome, has been divided in spiritual communion from the other four Patriarchates, and has separated itself by adopting customs and dogmas alien to the Catholic Church and to the Orthodox ... So no Latin should be sanctified by the hands of the priests through divine and spotless Mysteries unless he first declares that he will abstain from Latin dogmas and customs, and that he will conform to the practice of the Orthodox. On the other side of the widening rift, Eastern Orthodox were considered by western theologians to be Schismatics. Relations between East and West were further estranged by the tragic events of the Massacre of the Latins in 1182 and Sack of Constantinople in 1204. Those bloody events were followed by several failed attempts to reach reconciliation (see: Second Council of Lyon, Council of Florence, Union of Brest, Union of Uzhhorod). During the late medieval and early modern period, terminology became much more complicated, resulting in the creation of parallel and confronting terminological systems that exist today in all of their complexity. During the Early Modern period, a special term "Acatholic" was widely used in the West to mark all those who were considered to hold heretical theological views and irregular ecclesiastical practices. In the time of Counter-Reformation the term Acatholic was used by zealous members of the Catholic Church to designate Protestants as well as Eastern Orthodox Christians. The term was considered to be so insulting that the Council of the Serbian Orthodox Church, held in Temeswar in 1790, decided to send an official plea to emperor Leopold II, begging him to ban the use of the term "Acatholic". The Augsburg Confession found within the Book of Concord, a compendium of belief of the Lutheran Churches, teaches that "the faith as confessed by Luther and his followers is nothing new, but the true catholic faith, and that their churches represent the true catholic or universal church". When the Lutherans presented the Augsburg Confession to Charles V, Holy Roman Emperor in 1530, they believe to have "showed that each article of faith and practice was true first of all to Holy Scripture, and then also to the teaching of the church fathers and the councils". The term "Catholic" is commonly associated with the whole of the church led by the Roman Pontiff, the Catholic Church. Other Christian churches that use the description "Catholic" include the Eastern Orthodox Church and other churches that believe in the historic episcopate (bishops), such as the Anglican Communion. Many of those who apply the term "Catholic Church" to all Christians object to the use of the term to designate what they view as only one church within what they understand as the "whole" Catholic Church. In the English language, the first known use of the term is in Andrew of Wyntoun's Orygynale Cronykil of Scotland, "He was a constant Catholic/All Lollard he hated and heretic." The Catholic Church, led by the Pope in Rome, usually distinguishes itself from other churches by calling itself the "Catholic", however has also used the description "Roman Catholic". Even apart from documents drawn up jointly with other churches, it has sometimes, in view of the central position it attributes to the See of Rome, adopted the adjective "Roman" for the whole church, Eastern as well as Western, as in the papal encyclicals Divini illius Magistri and Humani generis. Another example is its self-description as "the holy Catholic Apostolic Roman Church" (or, by separating each adjective, as the "Holy, Catholic, Apostolic and Roman Church") in the 24 April 1870 Dogmatic Constitution on the Catholic Faith of the First Vatican Council. In all of these documents it also refers to itself both simply as the Catholic Church and by other names. The Eastern Catholic Churches, while united with Rome in the faith, have their own traditions and laws, differing from those of the Latin Rite and those of other Eastern Catholic Churches. The contemporary Catholic Church has always considered itself to be the historic Catholic Church, and consider all others as "non-Catholics". This practice is an application of the belief that not all who claim to be Christians are part of the Catholic Church, as Ignatius of Antioch, the earliest known writer to use the term "Catholic Church", considered that certain heretics who called themselves Christians only seemed to be such. Regarding the relations with Eastern Christians, Pope Benedict XVI stated his wish to restore full unity with the Orthodox. The Roman Catholic Church considers that almost all of the ancient theological differences have been satisfactorily addressed (the Filioque clause, the nature of purgatory, etc. ), and has declared that differences in traditional customs, observances and discipline are no obstacle to unity. Recent historic ecumenical efforts on the part of the Catholic Church have focused on healing the rupture between the Western ("Catholic") and the Eastern ("Orthodox") churches. Pope John Paul II often spoke of his great desire that the Catholic Church "once again breathe with both lungs", thus emphasizing that the Roman Catholic Church seeks to restore full communion with the separated Eastern churches. All of the three main branches of Christianity in the East (Eastern Orthodox Church, Oriental Orthodox Church and Church of the East) are continuing to identify themselves as Catholic in accordance with Apostolic traditions and the Nicene Creed. The Eastern Orthodox Church firmly upholds the ancient doctrines of Eastern Orthodox Catholicity and commonly uses the term Catholic, as in the title of The Longer Catechism of the Orthodox, Catholic, Eastern Church. So does the Coptic Orthodox Church that belongs to Oriental Orthodoxy and considers its communion to be "the True Church of the Lord Jesus Christ". Non of the Eastern Churches, Orthodox or Oriental, have any intention to abandon ancient traditions of their own Catholicity. Most Reformation and post-Reformation churches use the term Catholic (often with a lower-case c) to refer to the belief that all Christians are part of one Church regardless of denominational divisions; e.g., Chapter XXV of the Westminster Confession of Faith refers to the "catholic or universal Church". It is in line with this interpretation, which applies the word "catholic" (universal) to no one denomination, that they understand the phrase "one holy catholic and apostolic Church" in the Nicene Creed, the phrase the Catholic faith in the Athanasian Creed and the phrase "holy catholic church" in the Apostles' Creed. The term is used also to mean those Christian churches that maintain that their episcopate can be traced unbrokenly back to the apostles and consider themselves part of a catholic (universal) body of believers. Among those who regard themselves as Catholic but not Roman Catholic are Anglicans and Lutherans, who stress that they are both Reformed and Catholic. The Old Catholic Church and the various groups classified as Independent Catholic Churches also lay claim to the description Catholic. Traditionalist Catholics, even if they may not be in communion with Rome, consider themselves to be not only Catholics but the "true" Roman Catholics. Some use the term "Catholic" to distinguish their own position from a Calvinist or Puritan form of Reformed-Protestantism. These include a faction of Anglicans often also called Anglo-Catholics, 19th century Neo-Lutherans, 20th century High Church Lutherans or evangelical-Catholics and others. Some Independent Catholics accept that, among bishops, that of Rome is primus inter pares, and hold that conciliarism is a necessary check against ultramontanism. They are however, by definition, not recognised by the Catholic Church. Some Protestant churches avoid using the term completely, to the extent among many Lutherans of reciting the Creed with the word "Christian" in place of "catholic". The Orthodox churches share some of the concerns about Roman Catholic papal claims, but disagree with some Protestants about the nature of the church as one body. ^ Western Christianity includes both the (Roman) Catholic Church, Protestant Churches that share historic ties with the Catholic Church, as well as independent Catholic Churches that split later. ^ "Online Etymology Dictionary". Etymonline.com. Retrieved 16 September 2011. ^ "On Being Catholic," by Claire Anderson M.Div. Chisholm, Hugh, ed. (1911). "Catholic" . Encyclopædia Britannica. 5 (11th ed.). Cambridge University Press. p. 532. ^ "catholic". Oxford University Press. Retrieved 24 December 2014. ^ American Heritage Dictionary (4th ed.). ^ a b c Inventing Latin Heretics: Byzantines and the Filioque in the Ninth Century at Google Books pp. ^ a b "Chapter VIII.—Let nothing be done without the bishop". Christian Classics Ethereal Library. Retrieved 21 November 2008. ^ "Ignatius Epistle to the Smyrnaeans". ^ "Medieval Sourcebook: Theodosian Code XVI". ^ Angle, Paul T. (2007). The Mysterious Origins of Christianity. Wheatmark, Inc. ISBN 9781587368219. ^ J. H. Srawley (1900). "Ignatius Epistle to the Smyrnaeans". Retrieved 24 June 2007. ^ "As certain unbelievers maintain, that He only seemed to suffer, as they themselves only seem to be Christians". Ignatius said these heretics did not believe in the reality of Christ's flesh, which did suffer and was raised up again: "They confess not the Eucharist to be the flesh of our Saviour Jesus Christ, which suffered for our sins, and which the Father, of His goodness, raised up again" (Smyrnaeans, 7) and called them "beasts in the shape of men, whom you must not only not receive, but, if it be possible, not even meet with" (Smyrnaeans, 4). ^ "Catechetical Lecture 18 (Ezekiel xxxvii)". newadvent.org. Retrieved 31 March 2012. ^ Bettenson, Henry (1967). Documents of the Christian Church. Oxford University Press US. p. 22. ISBN 9780195012934. ^ "Chapter 5.—Against the Title of the Epistle of Manichæus". Christian Classics Ethereal Library. Retrieved 21 November 2008. ^ Vincent of Lerins. "A Commonitory for the Antiquity and Universality of the Catholic Faith Against the Profane Novelties of All Heresies". Christian Classics Ethereal Library. Retrieved 5 March 2012. ^ "Catholic", in Oxford English Dictionary(1989), New York: Oxford University Press, [spelling modernized]. ^ Pope Pius IX; Vatican (24 April 1870). "First Vatican Council – Session 3: Dogmatic constitution on the Catholic faith". Retrieved 24 June 2007. ^ Catholicity and the Church at Google Books pp. ^ "The Book of Common Prayer - The Athanasian Creed". The Church of England. 18 January 2019. ^ Alden, Henry Mills (1868). Harper's new monthly magazine, Volume 37, Issues 217-222. Harper's Magazine Co. Retrieved 25 March 2007. The various Protestant sects can not constitute one church because they have no intercommunion...each Protestant Church, whether Methodist or Baptist or whatever, is in perfect communion with itself everywhere as the Roman Catholic; and in this respect, consequently, the Roman Catholic has no advantage or superiority, except in the point of numbers. As a further necessary consequence, it is plain that the Roman Church is no more Catholic in any sense than a Methodist or a Baptist. ^ a b Harper's magazine, Volume 37. Harper's Magazine Co. 1907. Retrieved 25 March 2007. For those who "belong to the Church," the term Methodist Catholic, or Presbyterian Catholic, or Baptist Catholic, is as proper as the term Roman Catholic. It simply means that body of Christian believers over the world who agree in their religious views, and accept the same ecclesiastical forms. ^ "Nicene Creed". The Lutheran Church, Missouri Synod. Archived from the original on 27 May 2008. Retrieved 24 June 2007. ^ "Nicene Creed". Wisconsin Evangelical Lutheran Synod. Archived from the original on 2 January 2008. Retrieved 24 June 2007. ^ "Nicene Creed". International Lutheran Fellowship. Archived from the original on 28 September 2007. Retrieved 24 June 2007. Look up Catholic or catholic in Wiktionary, the free dictionary.